Spring came in like a lion so hopefully will go out like a lamb. With it’s arrival comes the nicer weather, grass, flowers and Easter! Today I have a recipe that could really be made anytime of year, but I think it is a good fit for the nice Spring weather that is hopefully coming our way shortly. It uses only four ingredients and is simple to make. 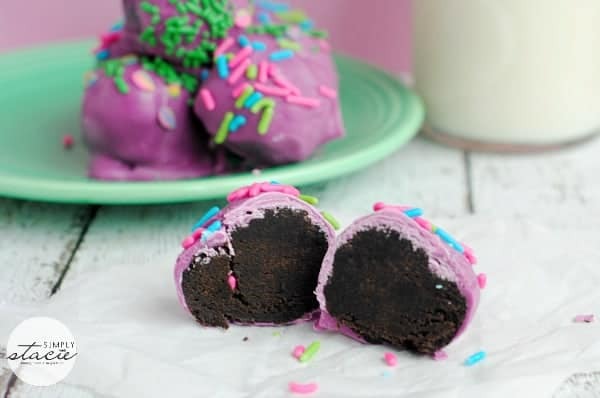 Crushed Oreo cookies wrapped in a candy melt with sprinkles! Combine the crushed Oreo cookies with the cream cheese. A food processor or a hand mixer comes in very handy for this part. Once the Oreos and cream cheese are combined, roll the mixture into 1” balls and place on a cookie sheet. Let sit in the fridge for 45 minutes to an hour so they harden up. In a microwave safe bowl heat the Wilton candy melts stirring in 30 second increments until melted completely. Let cool 2-3 minutes. 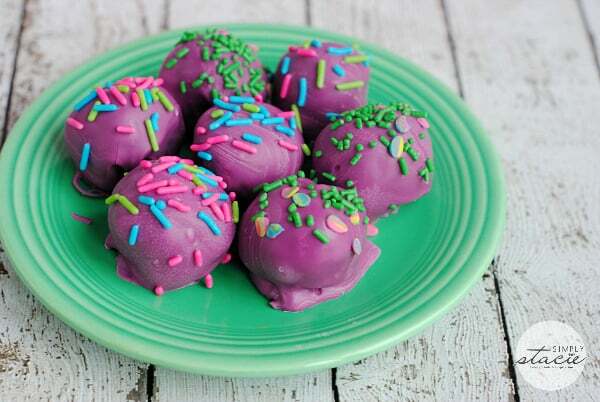 Dip the hardened truffles into the chocolate one at a time and add sprinkles on top before the chocolate sets. Repeat with the other truffles. Once all truffles are dipped and sprinkled place in the fridge to set for 1 hour before serving. These look so yummy! Can’t wait to try them!!! These look delicious and very cute! Oh my goodness! Those look so tastey, I will have to make some with my mini chefs. They love making sweets. These look so yummy & easy to make. Great suggestion, thanks for sharing! These look great! They could even be green for st. patty’s! 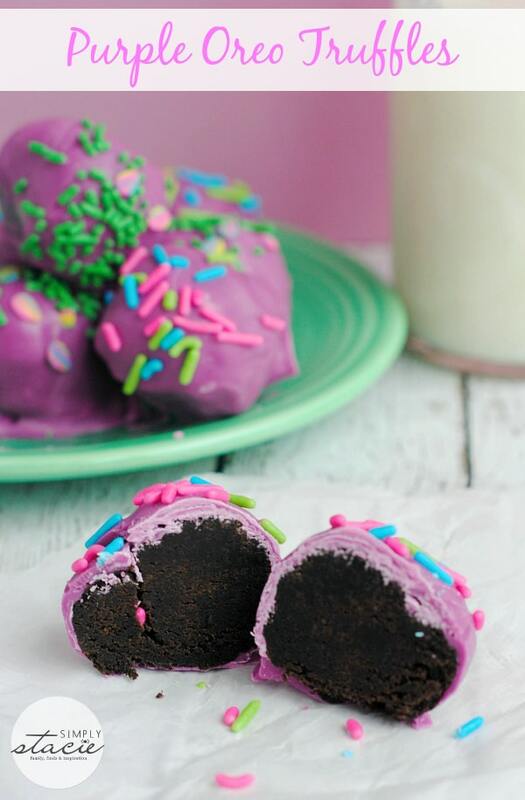 Oreo truffles have been a family holiday staple of ours for so many years, and I don’t think I’ve ever colored the candy coating. Such a cute idea! I think we may have to do that this year! Thank you so much for linking these up with Mouthwatering Mondays! I just made these the other day for my daughter’s preschool snack, they were a big hit. Will be making more for home! 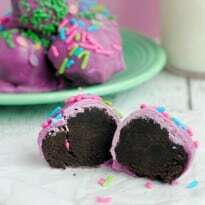 What a beautiful Purple Oreo Truffle, a very special treat. Thank you so much for sharing with Full Plate Thursday and have a great week!